With a sleek contemporary design, the juno offers practitioners the perfect versatile all around stool. Constructed of a soft, supple padded seat, the juno offers up to 300lb users an easy option for adjusting Height position. Each stool comes with a gas lift tested to 100,000 operations. The Height can be adjusted up and down which is perfect for reiki therapy, massage, tattoo, doctors, dentists and other practitioners. An adjustable Height gas lift strut system with 360° swivel complete the stool giving bounce, rotation and flair! the whole stool Stands on a sturdy chrome frame and has 5 high quality rolling casters enabling the user to roam freely on hard floors. The sleek design of the juno fits any environment and any décor be it retro or contemporary. Measures 15" wide by 17.5" deep. Seat Height adjusts from 18" to 24.5"
The stool's height is fully adjustable and keeps the clients within reach while in a sitting position. 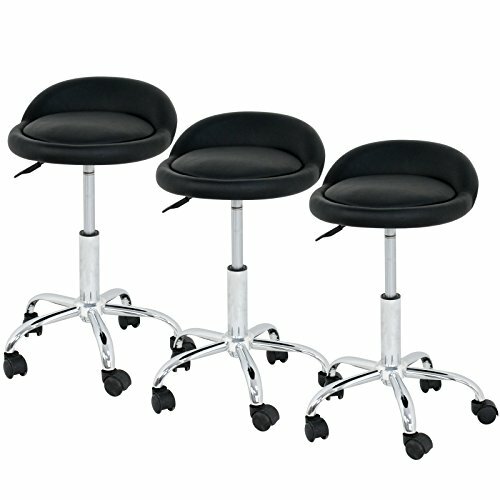 Seat Height adjusts from 18" to 24.5",overall stool Height adjusts from 21" to 27"